I think you’ll agree when it’s hot inside we want the best solution available to us in order to cool down. And that’s probably what lead you here. Both a tower fan and an air cooler (also known as a swamp & evaporative cooler) are both great ways to help cool your room but which is best? Well, it depends on a number of factors and in this post, I’ll address those which should help you decide whether a tower fan vs an air cooler is right for you. • How do they cool and which is better at cooling? • What sizes do they come in and which is best? A medium sized evaporative cooler covering up to 750sq ft.
A high-velocity tower fan which is probably more basic than other tower fans, but is extremely reliable and moves more air than most other tower fans. A good start if you are looking for simple reliable tower fan. How do they cool and which is better at cooling? It’s probably important to start by explaining how the two units work as they work very differently and this may inevitably determine which unit would be better for you. In this article, we detail how tower fans work but in short, tower fans HELP cool you by providing your room with circulation. They use the cool air from floor level (remember heat rises) and blow that air out into the room circulating the air so as to create a wind chill factor. Most of the time they are used in conjunction with an AC unit in order to help move the cool air your AC blows around. Alternatively, fans can be used to directly blow onto you which gives much more of a cooling effect than just circulating the air in the room. It is important to note the tower fans DO NOT cool the air. In contrast, air coolers work quite differently. Air coolers work by using warm dry air and sucking that air in through the unit through wet pads. The wet pads lower the temperature of said air which is then blown out into your room, reducing the temperature of your room, while also adding moisture, or humidity into your room. Now, this is the kicker. Adding humidity to the air is not going to work for everyone and can also create some issues which we will detail later. Air coolers work best in hot DRY climates as it intakes dry air and exhausts moist air. This means that air coolers do not work well at all in climates that are already humid. This is probably the most important point to consider when considering an air cooler. Be sure to know your climate. What sizes do they come and which is best? When looking for a tower fan you will generally find that they come in relatively similar sizes. 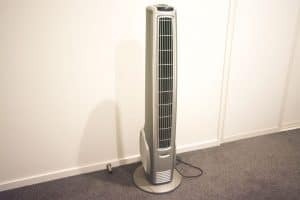 Bar a few inches here or there, tower fans don’t tend to vary much in size and can generally range up to 60 inches high. You do get fans that have larger motors, which might add some bulk, or taller fans, but relative to air coolers, the size difference is negligible. Most tower fans are made for small to medium size rooms. Air coolers, however, range from small personal desktop coolers all the way up to whole house coolers which can cool up to an 800 sq ft home. Most are portable units, but some of the larger coolers are obviously more permanent fixtures. One thing that most people want to consider before they purchase a cooling device is how much energy it uses and what it will cost them. The good news is that both a tower fan are quite cheap to run, especially compared to an air conditioner. According to Canstarblue a tower fan on high uses up to 100w and we confirm that when we tested the powerful hybrid tower fan, Lasko 4443, which used up to 80w on high. We found a medium-size air cooler, to get a comparative size to your typical tower fan and found they consume around 75w for an air cooler that cools around 475 sq ft.
Timer – lets you set a certain amount of time for the appliance to run before it turns off automatically. Speed variation – Rather than have the fan running at one speed all the time, you can choose between speeds. Keeping it on a lower setting will reduce its energy consumption. Light dimmer – some air coolers and tower fans have an optional or standard night light function (some newer models have LCD screens, as well). Try to choose one that has a dimmer option. The less light it puts out the less electricity it’s using. Let’s take a look at the differences between the purpose of these two cooling appliances, as well as the important features they both have. Both of these appliances are obviously used to keep you cool, but which does the job better? Which is the right choice for your workplace or household? Stability – Nobody wants a fan or cooler that’s on the verge of falling over every time it’s bumped. Fortunately, most modern air coolers and tower fans are built with stability in mind. Portability – If you find that various parts of your home or workspace require cooling at different times, you’ll likely want an appliance that’s easy to carry around. 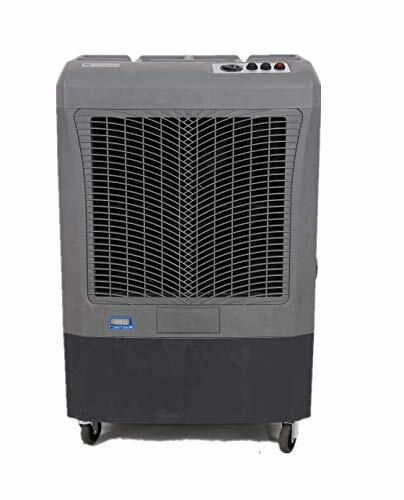 In this regard, tower fans tend to be more portable than air coolers, though there are some air coolers that are designed to be easily moveable. Space usage – It’s not ideal to have a fan or cooler taking up a large part of a room. When buying, it’s always a good idea to consider the space usage a particular appliance would need. Tower fans generally require less room than air coolers do. Ionization – Some types of tower fans come with built-in air ionizers. In addition to cooling the air, the ionizer purifies it as well, removing harmful microbes and particulates. Remote controls – While remote controls aren’t entirely necessary, they do offer an extra level of convenience, particularly if you want to turn the appliance on or off from the comfort of your bed. Both air coolers and tower fans are available with remote controls. Timers – as previously discussed, many fans and coolers are available with a timer feature. A timer is advised, as it allows you to set the hours the appliance is functioning, which can cut down on unnecessary energy usage. Noise – While some noise is unavoidable with both of these types of appliances, nobody wants one that sounds similar to a jet engine while operating. Tower fans are typically a lot quieter than air coolers, which means you’ll hardly hear them when they’re working. Air coolers tend to be louder, which is something to consider if excess noise bothers you. Air direction – Most tower fans allow you to control the direction the air is blowing in, either through manual adjustment or through oscillation. Air coolers lack any sort of oscillation, meaning that you need to position them in order to get the desired air flow direction. Aesthetics – While you will be purchasing these types of appliances for the utility they offer, there’s also the aesthetic appeal to consider. 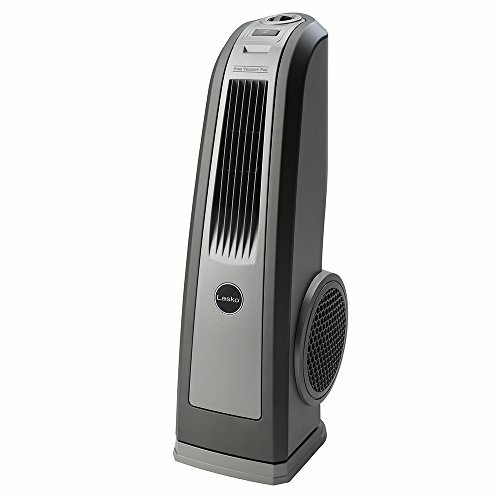 By and large, tower fans have a more pleasing appearance as they’re typically tall, slender, and sleekly modern. While the same can be said for some air coolers, the majority tend to be large, bulky, and rectangular – not quite the aesthetic most people want in their homes. For a better idea of which of these will work best for you, let’s take a minute to go over the pros and cons of each. In climates where the air is dry, you might suffer from dry eyes, chapped lips, and dry skin. What’s more, dry air can be detrimental to certain materials, causing them to crack. Air coolers add humidity to the air through the evaporative cooling process. This eliminates many of the problems that come from dry air. The operating cost of an air cooler is far cheaper than that of an air conditioner (by as much as 75 percent). They also typically have lower purchase and installation costs, and don’t require as much electricity to run as air conditioners do. The filters in air coolers ensure that pollen and dust are removed from the air, making it healthier to breathe as it eliminates harmful bacteria and particulates. Air coolers are eco-friendly because they don’t require any refrigerants or other chemicals to cool the air. The cooling process is completely natural and as we’ve already mentioned, air coolers also consume far less energy than air conditioners do. Through the evaporative cooling process, air coolers actually freshen the air. This makes it smell better, adds humidity, and makes it healthier to breathe. Due to the way air coolers work, they require regular maintenance to prevent the growth of mold and an unpleasant musty smell. An air cooler that goes untended for an extended period of time becomes a breeding ground for bacteria, as well. In order to function, air coolers need a consistent supply of water. In areas where water is a costly utility, this could lead to prohibitively expensive operating costs. 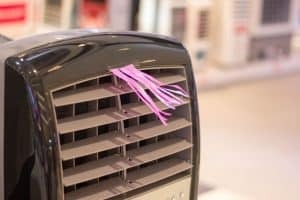 Another downside of an air cooler is that it can lead to your home feeling “sticky.” This is due to the warm humidity it is constantly putting out. This effect will be worse in warmer weather. Air coolers are at their most effective in drier climates, due to the fact that there’s a notable lack of moisture in the air. In humid climates they are not anywhere near as effective, and it’s likely a good idea to find a different method of cooling your home. Unlike air conditioners or some tower fans, there’s no way to control the temperature with air coolers. They’ll cool the air a certain amount, but you won’t be able to adjust that amount. If you’d prefer to be able to control the temperature, it might be best to go with another option. Air coolers are not ideal for households with people who suffer from asthma or other respiratory illnesses, as an excess of humidity can actually make symptoms worse. In places with hard water, it may lead to an unwanted build-up of salt inside the air cooler. This can lead to the need for frequent maintenance or the air cooler not functioning as it should. While a certain amount of humidity is ideal in a home, too much can lead to problems with electronics. Too much humidity can alter the conductivity in these devices, resulting in malfunction, damage, and corrosion. The ideal humidity level for electronics is between 30 and 50 percent. For peak effectiveness, an air cooler needs proper ventilation. Air flow is essential in order to get the full effect, which means you’ll need to rearrange the room in order for the air cooler to have access to ventilation. An air cooler that’s running constantly can lead to too much humidity in the air, and when that happens there’s the potential for mold to grow on hardwood floors. A house with hardwood floors may be better suited to a different cooling method. Some tower fans have ionizers, which work by both purifying the air and removing dander, dust, and pollen. An ionizing tower fan is a great choice in a home where more or one person suffers from allergies. Tower fans are very easy to move around. If you need different rooms cooled at different times, it’s no problem at all to relocate a tower fan to wherever you need it. In contrast, air coolers tend to be much less portable, which makes moving them a pain. Tower fans allow you to adjust the speed, which means you can control just how breezy it gets when you’re trying to cool down on a hot day. You can keep them on full blast during the hottest hours and drop them down to low when it cools outside. As far as looks go, tower fans tend to look a lot sleeker and unobtrusive than other cooling appliances such as coolers and conditioners. They blend into the existing aesthetic easily. Tower fans require little to no maintenance other than turning them on and off. This is ideal if you’re often busy and don’t have time to do regular cleaning. As a side bonus to this, there’s no risk of mold or musty smells with a tower fan, either. There’s no risk of humidity related issues with a tower fan. You won’t have to worry about mold growing either on the fan or on your hardwood floors when you’re using one. A tower fan is just as effective in a high humidity climate as it is in one with low humidity. This is because it doesn’t use water to cool the air; instead, it utilizes air flow to make you feel cooler. Tower fans don’t actually cool the air. On very hot days, even if you have your tower fan turned on to the highest setting, it’s just pushing around existing hot air. This can lead to your house still feeling stuffy and hot. A tower fan isn’t as effective at cooling a large area as an air cooler or air conditioner is. Even when oscillating, it’s not going to make a huge difference. If you want an effective cooling option for a bigger space, you may need to consider an air cooler instead. In drier climates where a little extra humidity is ideal, a tower fan won’t help as it doesn’t use moisture. This means that dry air will still stay dry and can lead to problems with eyes and skin. Tower fans need to run constantly in order for a room to feel cooler. In comparison, the cooling effect of an air conditioner or cooler will last for a while even after they’re turned off. If you want a lasting effect, a tower fan may not be the way to go. 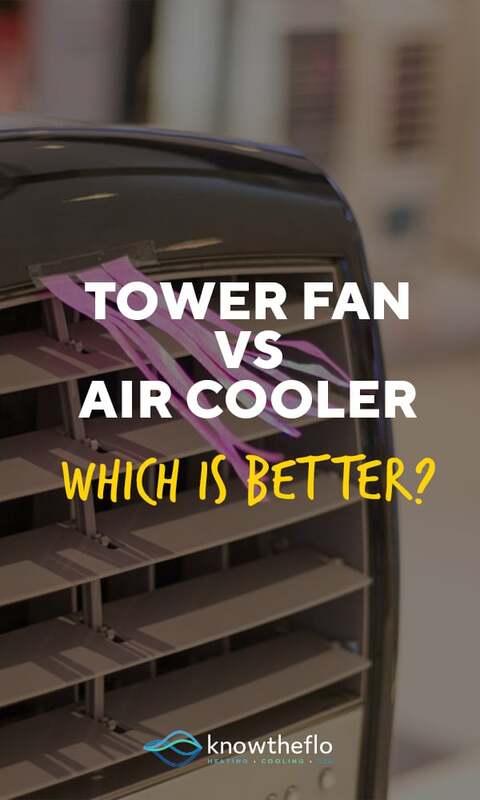 On the surface, it may seem like a tough choice, but in the end, the differences between a tower fan and air cooler are quite sharp. Tower fans require far less maintenance, give more control over their settings, have little chance of creating health issues are generally cheaper and work in any climate. Although air coolers will not work in all climates, they cool the air far better, can help dry skin issues, are a much cheaper altenative to an AC and create mush cleaner and fresher air in your home.